Comment: Frank M. Yamada explains that Jeremiah’s action is symbolic of God’s word for the people. “Today’s passage reminds us God is invested in the future destiny of humankind… God’s people would be restored and would again thrive in the land. Perilous times require the faithful to put into embodied action the hope that God has announced, which is already here, but not yet.” (http://www.workingpreacher.org/preaching.aspx?commentary_id=743) A Castle on Viola Street is the story of an organization like Habitat for Humanity, that brings together families and volunteers to create houses for people who need them. Like Jeremiah’s purchase of the field, the work done to the abandoned houses on Viola Street is an embodied action of hope for the future. This text and story invite us to wonder about the ways we embody God’s hope in the midst of perilous and difficult times. Comment: “They are to do good, to be rich in good works, generous, and ready to share, thus storing up for themselves the treasure of a good foundation for the future, so that they may take hold of the life that really is life.” When reading this text, consider it an invitation to share stories of people who embody this way of life described in the epistle. 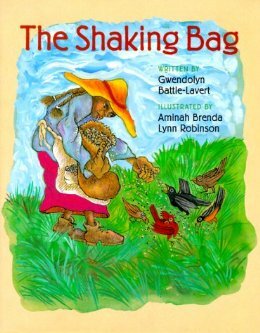 The Shaking Bag is one example of someone who is rich in good works. Though Miss Annie Mae is very poor, she shares everything she has. Because of her generosity, there is always enough. Through her kindness, Miss Annie Mae takes hold of the life that really is life. Lectionary Links: Sunday, September 29, 2013 by Storypath is licensed under a Creative Commons Attribution-NonCommercial 4.0 International License.